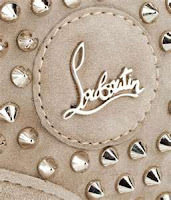 This blog post started out to be a 'look for less' piece where I can find the budget fashionista AKA PrivyDoll a great find of studded gym shoes to compliment the Louboutins that launched at a price that wont be as much as our rent. However, after some more research, I see that these sneaks have gained more press and concerns with the fully spiked shoe craze. Check out this article from Racked about the TSA confiscating a pair because they appeared to be a weapon! I can chime in here because every time I fly with my Alexander Wang studded bag they stop me with the concern of the studded bottom appears as bullets on the screen. I would put up quite a fight if they tried to confiscate it from me. It would be missing a flight-worthy of a fight. 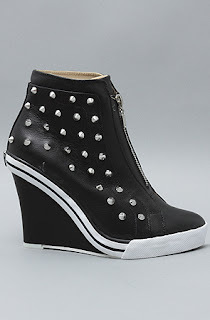 I adore these new kicks but here is also a look for less find! Here are the high tops fround on Net-A-Porter for $549. 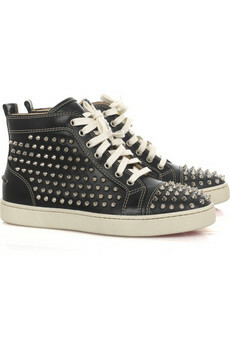 You can acheive this hot new sneaker look with these found HERE for only $104. Love the wedge element which is also a big trend right now!